UNITED STATES: Offshore wind developer Deepwater Wind has unveiled plans to install a 144MW offshore wind project, combined with a 40MWh Tesla battery system. The Revolution Wind project will be installed 96km off the coast of Massachusetts and 19km south of Martha's Vineyard, next to the developer's 90MW South Fork proposal. It is set to be installed in the federal lease area, won by Deepwater Wind in 2013. Deepwater Wind submitted the bid as part of Massachusetts request for proposals for new sources of energy. "Revolution Wind will be the largest combined offshore wind and energy storage project in the world," said Deepwater Wind CEO Jeffrey Grybowski. "[It] is flexible and scalable. That's a serious advantage of offshore wind — we can build to the exact size utilities need. "We can build a larger project if other New England states want to participate now, or we can start smaller to fit into the region's near-term energy gaps. And our pricing at any size will be very competitive with the alternatives, " Grybowski said. The developer said it also tabled a 288MW and a 96MW version of the project. In December 2015, the firm proposed adding a lithium-ion storage facility to the South Fork project on the nearby Long Island. 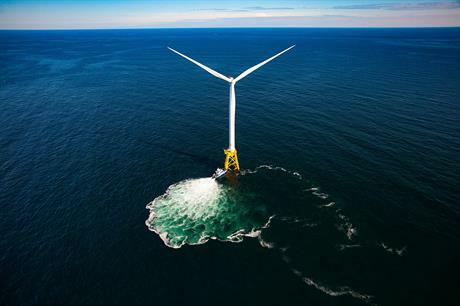 Deepwater Wind was the developer behind the US's first offshore wind project, the 30MW Block Island site. Tesla has already made inroads in the renewable energy storage sector this year by winning a contract to supply a 129MWh battery system to the grid in South Australia, which will be powered by the Hornsdale onshore wind project.